As part of our recent 13-vessel shipbuilding program, over the course of 2013–2015, Chevron Shipping Company took delivery of one Suezmax dynamically positioned (DP) shuttle tanker, two Suezmax DP lightering vessels, four very large crude carriers and four liquefied natural gas (LNG) carriers. Our newest vessel, the Asia Endeavor, is the fourth of six new LNG carriers being built to support our growing role as a leader in LNG. The last two ships are scheduled for delivery in 2017. Chevron is currently undertaking the largest shipbuilding and fleet modernization program in recent corporate history. As part of this program, the company will be taking delivery of six new LNG tankers to support our growing role as a leader in LNG. By liquefying natural gas, we are able to transport it safely and efficiently. In 2015, two new state-of-the-art LNG carriers joined our fleet. At the conclusion of the current shipbuilding effort, Chevron will have a total of 10 LNG carriers in our operated fleet. The addition of these ships will enable us to further link our projects to the market and help meet the growing demand for LNG around the world. Each of our new LNG ships includes four cargo tanks. Each tank can hold approximately 40,000 cubic meters of liquefied natural gas and keep it at the necessary −260 degrees Fahrenheit (−162° C) as it travels across the oceans. And cleaner-burning natural gas can be used to power the ships themselves. 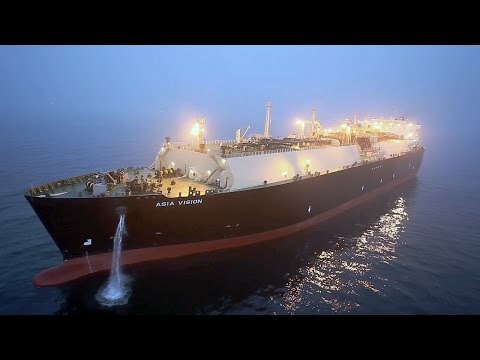 The Asia Energy, one of the new LNG carriers, during sea trials in South Korea. Chevron Shipping Company operates a fleet of approximately 30 ships – from conventional crude and product carriers to technologically advanced DP vessels and LNG carriers. In addition to providing marine transportation for the company, Chevron Shipping provides technical, commercial and operational support to projects such as the Papa-Terra Field offshore Brazil and the Gorgon and Wheatstone LNG developments offshore Western Australia.